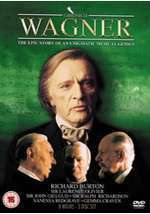 Wagner is a novelisation of Charles Wood's brilliantly imaginative screenplay, written in the early 1980s. Directed by Tony Palmer, the film starred Richard Burton, in his last major role, and Vanessa Redgrave, and uniquely brought together the three knights, Olivier, Gielgud, and Richardson. Richard Hornak, in Opera News , found it to be one of the most beautiful motion pictures in history. It was produced with a running time of seven hours and 46 minutes (read more here in Wikipedia). Wagner film, directed by Tony Palmer, screenplay by Charles Wood, 1984. Translations of the book were successfully published in Germany and Italy, where the film was serialised on TV. But even though the film has been available on VHS & DVD for the last 30 years, the book remained unpublished in the UK. Now that the film has been remastered in Hi-Definition*, in time for the 200th anniversary of Wagner's birth, the novelisation is at last available in the language in which I wrote it. I love it. You have done an enormous amount of work and research outside of the confines of the screenplay - and it all fits, indeed it has given me a good few ideas about how the next version of it might go. It would be terrific on the stage. Karl was not to be deflected. 'I was not mistaken. He called me a baboon. I have communicated the dreadful humiliation to my mother. Baboon face...' Karl snarled quietly. Wagner had risen from his chair, clapping warmly, and was coming across to speak to Minna. Karl gasped, 'Ohhh! ', and stormed away to the far side of the ballroom, his jaw quivering. 'Is he?' Wagner was not listening to Minna, nor to the poem. He was looking at Mathilde Wesendonck, who had just spoken so charmingly to them all. 'Did it?' Wagner was still not listening. Minna shrugged, with dismay. How was she to know? Also, she would have liked to say under different circumstances, she had noticed the fluttering eyelashes that Frau Heim directed at her husband, but whether their welcome was more than musical, how was she to know? To turn his music for him, Liszt had Hans von Bülow at his side. 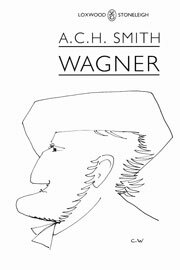 Wagner had the greatest confidence in Bülow; not only was he a protégé of Liszt, and affianced to Liszt's daughter Cosima, but the fine young fellow had made himself a virtual outcast from the musical world of Berlin through his passionate championing of Wagner's music. Again and again, in articles entitled, 'Art and Revolution' or 'The Art-Work of the Future', he had assailed with unhoneyed words the aunties, the dotard critics, whose delusion it was that Meyerbeer and Mendelssohn had ever written a note worth hearing. He had arrived in Zürich with the news that the battle was raging ever hotter. Wagner had a warm pat on the shoulder for Bülow as Liszt led them into the Valkyrie . While he sings, knowing it so well, Wagner has time to keep an eye on the audience. He notes Wesendonck stifling another yawn, thereby attracting a cross glance from his wife Mathilde, and rallying his attention to look up at the performers, where he meets Wagner's basilisk eye, and confusedly lowers his gaze again. Near the Wesendoncks are an older couple, also patrons of the arts, but who seem to have no difficulty in listening to the art they patronize: Doctor Wille, whose views on politics are as pugnacious as his scarred face testifies his private life has been, and Frau Wille, irredeemably plain, but an intelligent and cultivated hostess of the salon. She is a particular friend of the striking figure leaning on the end of the piano and smoking a cheroot, the Princess Carolyne von Sayn-Wittgenstein, thin and thirtyish, Liszt's mistress but not to be his wife unless the Vatican grants the Prince a dissolution. People have remarked that the Prince, having been married to Princess Carolyne, is no stranger to dissolution already, but people will always make remarks of that sort at the sight of a blue stocking. With an encouraging glance at Frau Heim, in her aureole of golden hair, Wagner sounds the Motive of Renunciation, Zum letzten Mal letz' as mich heut mit des Lebewohles letzteng Kuss, and notes Mathilde's rapt expression, and also Karl Ritter edging toward the piano, where Liszt has the look on his face of a man who would by now be playing with his eyes closed in ecstasy had he performed this music just once before in his life. The moment they finished there was a burst of applause and bravos. Karl had seen his chance, but the most admirable Bülow had seen Karl even more quickly, had intercepted his lurching grievance, and was firmly leading Karl away. Wagner, under congratulations from Doctor and Frau Wille, had beady eyes. He was watching the idiot Ritter, who appeared to be safe for the moment in Bülow's hands, and he was watching Mathilde, whose opinion would be relishable. She, slowly followed by Wesendonck, had engaged Liszt and the Princess Carolyne in an earnest conversation, from which she hoped to draw cultural sustenance more substantial and worldly than the common fare in Zürich. 'Heine?' She picked a name, hoping that Liszt, with his urbanity, would make her a meal of it. Princess Carolyne puffed smoke. 'We think very little of the poet Heine.' Why should she bother to explain to this pretentious housewife that the poet Heine in his guise of musical critic had practised upon Liszt a version of simony, showing him the manuscript of a spiteful review and, upon receiving no bribe, increasing its spite for publication? Over her lovely shoulder, Mathilde cast an agonised look at her husband. He wisely refused to be drawn into the circle of hell she had made for herself. He stroked his beard, and pretended to be interested in the piano. Bowing to Liszt and the inevitable, Mathilde left, followed by Wesendonck. Wagner watched her go, then drew Liszt aside to whisper in his ear. Princess Carolyne also inclined her head to hear what Wagner had to say. She was not in favour of secrets. Karl, slowly approaching, watched the scene with satisfaction. Minna, too, sighed with relief when she saw Liszt nod, and Wagner look up and beckon Karl. Karl turned away, with a twitching face, and hastened to leave the ballroom. At the door, a footman handed him a commemorative medallion with a portrait of Liszt on it. Price £10, plus p & p: UK £1.50, Europe £4, elsewhere £7.